Is online learning part of your academic experience? The Appleton eSchool provides flexible 21st century learning opportunities for all students to blend online courses into their academic plans and schedules. Whether students are looking to get ahead, open up their schedule, or make-up some credits, the Appleton eSchool can help you reach your goals! The Appleton eSchool first began providing online learning opportunities to Appleton Area School District students during the 2002-2003 school year. Through numerous grants, the Appleton eSchool began gaining momentum in the quest to help provide a 21st century learning opportunity to all students in the Appleton Area School District. As of January 2009, the Appleton eSchool has provided over 2,400 students throughout the State of Wisconsin an online learning experience. Our mission is to utilize new and emerging technologies to provide students a pathway to achieve success within a 21st century learning environment. We will provide high-quality standards-driven curriculum that is able to accommodate students’ varying physical locations while providing flexible time frames and course pacing. Appleton eSchool should offer a wide variety of course options for high school credit as generated by students' needs and interests. Appleton Area School District students should be encouraged to complete at least one online course as preparation for an increasingly technological world. In general, it is not recommended that students take all of their high school courses through online learning. The future success of Appleton eSchool is contingent upon exploring and engaging in partnerships that maximize resources to benefit students. Mentor/Coaches are typically parents, but may also be resource teachers, local teacher contacts or anyone else that is monitoring the progress of an online student. The following link provides the contract used by all students taking online courses through the Wisconsin eSchool Network. The attendance requirement information is located within our student contract on the Student Contract page. The WI Digital Learning Collaborative (WDLC) has been established to provide equitable access to high quality online education by offering online learning to school districts, cooperative education service agencies, charter schools and private schools located in Wisconsin. The Appleton eSchool and Wisconsin eSchool Network are collaborating partners in this statewide digital learning effort. The Appleton eSchool is an invested member with the Wisconsin eSchool Network. As a partner of the Wisconsin eSchool Network, the Appleton eSchool students have access to statewide course offerings licensed by the Wisconsin eSchool Network (based on availability). The Appleton eSchool and the “Y” have teamed up to help provide full-time online students with the Appleton eSchool a place to learn, connect, and balance their lives. The “Y” and the Appleton eSchool believe it is important for everyone in the 21st Century to recognize a lifestyle that will lead to healthy and balanced living. More and more brain research is coming out supporting the benefits of exercise in relation to cognitive ability and mental health. Full-time Appleton eSchool students will be able to utilize this strategic partnership to create a lifestyle focused around learning and exercise. The downtown “Y” in Appleton has remodeled a commons area with some computers to provide Appleton virtual students a place to work on their online courses, connect and collaborate with classmates, and the convenience to build an exercise routine as part of their day. A VIRTUAL LOCAL HIGH SCHOOL In the fall of 2001, several Board of Education members and district administrators were discussing what it would take to initiate a virtual high school locally. It was decided that if someone could be found locally to lead the project, grant money would be sought to move the project forward as quickly as possible. PLANNING BEGINS The AASD board created and filled the new position of Program Leader for Online Learning. The research and planning was officially under way! A DPI Charter School Planning Grant was submitted in December of 2001. In January 2002, $10,000 in planning funds was awarded making it possible to move the project forward quickly. SCHOOL DISTRICTS COLLABORATE In March of 2003, at the Wisconsin Charter School Conference in Appleton, Paula Crandall-Decker from the DPI offered a financial incentive of an additional $40,000 each to the Appleton and Kiel districts for staff development and training if the districts would explore means to collaborate since the districts were working on similar projects. A PILOT PROJECT SPRING 2002 After revising the Planning Grant budget to include $50,000 instead of the original $10,000, the full amount was awarded to both districts and collaboration, research, staff development and training helped to put the project on a fast track. A pilot project was begun during the spring 2002 semester involving about 12 students and planning moved forward in earnest. SCHOOL OFFICIALLY OPENS FALL 2002 On April 24, 2002 the Board of Education officially approved the Charter for Appleton eSchool as an instrumentality of the Appleton Area School District and plans moved forward to officially open for the Fall semester of 2002. 70 STUDENTS ENROLLED FOR THE FIRST YEAR Projections for the 2002-2003 school year were to enroll 20-30 students in online courses. Appleton eSchool enrolled over 70 students during the first year with about 50 course completions expected by the end of the term. SETTING THE ONLINE LEARNING STANDARD During the spring of 2003, collaborative efforts extended beyond the Kiel eSchool. 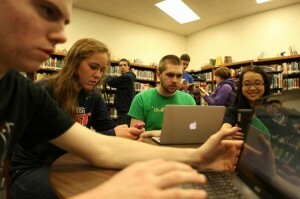 A TEACH grant awarded in January helped provide the infrastructure to form the Wisconsin Collaborative Online Network. This organization brought together representatives from the Department of Public Instruction, Administrator and School Board Associations, legislators, technical colleges, universities, Wisconsin Education Association Council and the online/virtual schools operating at the time. In the course of a year this group developed guidelines and standards for online learning. Monica Stage – President, Paul Painting, Dave Debbink, Sarah Debruin, Julie Prudom, Billie Sherman, Erik Hanson. February 5, 2009 December 3, 2009 December 7, 2010 December 13, 2011 December 4, 2012 December 3, 2013 October 28, 2014 October 27 October 25 October 24 October 23 - meeting canceled. WHO IS ELIGIBLE TO ENROLL IN ONLINE COURSES? Any Appleton Area School District student grades nine through twelve may request enrollment in eSchool courses. ~Classes may be taken as Part of their Schedule (Blended Schedule) or as an Extension of their schedule. Special consideration will be given to students with significant life obstacles: i.e. dropouts, adjudicated and/or incarcerated youth, teen parents, homebound students, students with physical, mental or emotional difficulties, voluntarily withdrawn or expelled students, self-supporting youth, transient students, students in treatment programs. Appleton Area School District residents who have not completed their graduation requirements and have not reached the age of 20 are eligible to take courses through Appleton eSchool whether or not they are attending any other district school. (Age 22 for EEN). WHY WOULD I TAKE AN ONLINE COURSE? ARE THERE ANY MIDDLE SCHOOL OPTIONS? Yes, 8th grade students may enroll in a summer interim class during the summer prior to their freshman year. During the school year, middle school students residing in the Appleton School District may be eligible for courses taken for enrichment but not high school credit. CAN HOME SCHOOL STUDENTS OR PRIVATE SCHOOL STUDENTS TAKE eSCHOOL COURSES? Appleton Area School District residents that are Home School students or students attending a private school, may take up to two courses per semester and still maintain their home school or private school status. Either or both of these could be online courses. WHAT IF I AM 20 YEARS OLD OR MORE AND AM INTERESTED IN COMPLETING MY DIPLOMA REQUIREMENTS? Adults over the age of 20 may be allowed to take online courses to complete their diploma requirements, if they are within 6 credits of earning their diploma and are either currently a resident of the Appleton Area School District or they earned most of their high school credits through one of the Appleton public high schools. These requests are considered on a case -by-case basis. WHEN CAN STUDENTS ENROLL IN ONLINE COURSES? eSchool offers “Onging” start dates. Students can choose to start classes from September through February. Please see our Key Date Timeline for exact enrollment dates. Placement will be based on the availability within the requested course and is contingent upon successful completion of the online orientation. WHAT TYPES OF COURSES CAN BE TAKEN ONLINE? All academic courses required for graduation are available in online format as well as Advanced Placement courses and a wide variety of electives. I HAVE REQUESTED A CLASS THROUGH MY ONLINE ACCOUNT, WHAT'S NEXT? For a school year course, your next step is to upload your student contract and wait for counselor review. Once your counsel or has approved your course, the status of your request will change to “waiting registrar review”. If you have an approved request and you have uploaded the contract, you can expect to be enrolled in the orientation during the next school day. Friday approvals will be generally be processed on Monday. HOW DO I UPLOAD A STUDENT CONTRACT? First take a picture or make a scan of your signed contract. Make sure the information is easy to read on your picture. Click “Upload Files”, then “Browse” and find your scan or picture and select “open”. If your contract fails to save to your account, the file may be too large. See if you can save your file to a different form at or with a lower resolution. This mini online course helps prepare students to be successful online learners. 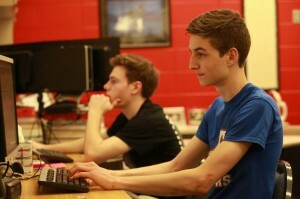 Students report it typically takes 2-3 hours to complete. Upon successful completion of the Orientation mini-course (after receiving a final grade), the student will be enrolled in their chosen course. WHAT IF I ALREADY DID AN ONLINE ORIENTATION? If you previously completed an orientation and successfully passed on online class, you will complete a refresher orientation. You will be able to skip ahead and do only module 4. With each new school year or summer interim session, all students complete some version of the online orientation once per school year or summer interim session. WHAT IS THE ROLE OF MY eSCHOOL COACH? Your coach is also your teacher for your Online Orientation class. They provides support, encouragement and assistance as needed and also act as a liaison with the online teacher. Please contact your coach with questions regarding your orientation, if you need help with your pacing or end date, and to schedule your final exam. WHAT IF THIS DOESN'T WORK FOR ME AND I NEED TO DROP? Students typically have 2 weeks from the date of their First Day of Class session (during the school year) to determine if online learning is a good fit for them. Students can drop their online courses without consequences during this designated drop window. Plan to commit as many hours to an online course as you would spend attending a course in the class room. For example, a student completing a class (.5 credit) in a semester, would typically spend from 5-7 hours per week on the course. If you plan to complete a full credit course in one semester you would need to spend 10-14 hours per week on the course. If you do not have strong reading skills you may have to spend more time each week in order to maintain an appropriate pace. HOW MANY COURSES CAN I TAKE AT ONE TIME THROUGH APPLETON eSCHOOL? Students will always start by taking one course. After successfully completing one course a student can request taking two courses simultaneously. Students seeking full-time online status must follow the Appleton Area School District protocol for placement at a school other than their high school of residence. Pace plans identify assignment due dates. Students are expected to stay on pace with these due dates to achieve course completion by the target end-date. Assignment grades may be reduced for submissions beyond the pace plan due date. If pacing needs to be revised, students are generally allowed one chance to adjust their course target end date during the regular school year. WHAT HAPPENS IF A STUDENT DOESN'T KEEP ON PACE? If a student is not on pace within the first two weeks of the course start date, they may consider dropping within the designated grace period (usually the first two weeks). Students may receive notice of a possible administrative withdrawal if they are not on pace by the end of week two. Throughout the duration of the course, students are required to submit at least one current assignment for each online course every calendar week (The eSchool calendar week runs Wednesday-Tuesday). Students violating this minimum attendance may receive notice of truancy requiring response by the parent or guardian. If there are extenuating circumstances interfering with the student’s ability to meet these attendance requirements, it is the responsibility of the parent or guardian mentor to contact the online teacher and/or the eSchool office staff. This information is outlined in our required student contract. HOW ARE PARENTS/GUARDIANS NOTIFIED OF A STUDENT'S PROGRESS? Regularly checking your email and/or logging in to your guardian account will provide key information concerning student progress. For help checking student progress, see our parent page. WHO DO I CONTACT IF I HAVE GUIDANCE COUNSELOR RELATED QUESTIONS? If you are attending an Appleton Area School District school, contact the guidance counselor or academic advisor assigned to you at your school. If you are only taking classes through the eSchool, the office staff will answer and direct your questions as needed. HOW OFTEN SHOULD I EXPECT TO COMMUNICATE WITH MY TEACHER? A student can expect a response to emails by the end of the next school day after the email is received. Assignments are typically graded within 48 hours on school days. Email is typically the most efficient means to communicate with your online teacher. Some teachers provide regular office hours when they are available via web conference or phone. These may be used for tutoring, oral assessments or collaborative activities. What specifications do I need on my computer for online classes? As long as you have Internet access and an internet capably personal computing device, you can take online courses. Browser Plug-ins may be required in some browsers. For example, google chrome may required some extensions to view some documents (.rtf) for example. Chromebooks work in most cases; however, be aware that chromebooks and browsers are dynamic and change frequently. Troubleshooting is likely. PC – Mac – Chromebook Requirements Modern computers within the last 10 years should be able to run most eSchool software and curriculum. Windows, Mac and chromebooks are usually just fine without much trouble. Audio: Sound card with speakers, microphone or headset (needed in some courses…most modern computers include all of this as part of the system whether laptop or desktop). The majority of eSchool courses work on Google Chromebooks. Dr. Mineau is the principal of both Appleton East High School and Appleton eSchool. Matt has served as the Associate Principal of East High School and the Principal of Tesla Engineering Charter School in Appleton. Mr. Hanson joined the Appleton eSchool in 2008 from Edina, Minnesota where he spent 8 years as a math teacher and webmaster. 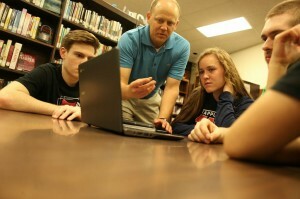 Mr.Hanson was involved with the infant stages of online learning in the Minneapolis area as he wrote curriculum and taught online algebra for the Edina Public Schools. Mr. Hanson’s office is located at Appleton East High School on the first floor near the elevator in the silo (circular) section of the school. Torrie is a graduate of the University of Wisconsin – Stevens Point in Sociology. Torrie has spent several years working with students & staff in AASD and is excited about her role supporting Appleton eSchool as secretary/registrar. Amy Sunke has several roles with eSchool. Amy is the Program Support Liaison for all full time students with eSchool. She is the go to person if you are a full time student with eSchool regarding your schedule, activation of courses or credits earned. Amy is also the Site Coordinator for all Appleton students that take a Virtual High School (VHS) course. She helps prepare students to take a VHS course by facilitating the VHS orientation, relaying any media that you might need, and connecting biweekly to offer you an online report that your teacher from VHS publishes. In addition, Amy is an online Teacher. She teaches the science courses for eSchool- Earth Space Science and Biology and teaches Bioethics Symposium and Anatomy and Physiology for the district through the Virtual High School. Jean holds a degree in International Studies from the University of Wisconsin-Oshkosh along with a Wisconsin license to teach Secondary Broadfield Social Studies. In addition to Jean’s program support position, she teachers social students during the eSchool summer session and in 2008 she served as the eSchool Summer School Coordinator. Mrs. Kinzenbaw earned her bachelor’s degree in English and education from The University of Iowa and she also holds a master’s degree in administration from Marian University. She has taught English Language Arts at West High since 2004. Mrs. Kinzenbaw can be found in room 246 at West High School. Mrs. Zanon teaches American History, World History and Civics with the Appleton eSchool. In addition to eSchool, Mrs. Zanon has been teaching at Appleton East High School since 1994. Throughout her tenure in Appleton, Mrs. Zanon has taught United States History, Contemporary World Studies, Civics, Social Problems and Special Education. If you need to reach Mrs. Zanon, she can be found working online most often during the morning and early afternoon hours. Ms. McAloon began teaching for Appleton eSchool in 2002 before she even owned a computer! The first class Ms. McAloon taught was Creative Writing, which she developed. Over the years Ms. McAloon has refined that class and found it to be an enjoyable class for her students and herself. Additionally, she has taught English I, II, III, and IV as needed. Teaching online has really encouraged her to explore and embrace technology. Mrs. Teske teaches Algebra and Geometry with Appleton eSchool. In addition to eSchool, Mrs. Teske has been teaching at Appleton East High School since 1999. If you need to reach Mrs. Teske, she can be found working online most often in the afternoons remotely or in the eSchool office. Mrs. Crum teaches Personal Financial Management with Appleton eSchool and in the classroom at East High School. Mrs. Van Camp has has also taught during the eSchool summer session and a couple pilot blended courses and with the eSchool & East High School. Mr. Reichardt has been teaching Personal Fitness and Fitness Lifestyle Design with Appleton eSchool since 2012. He is a physical education teacher and has been teaching at Appleton East High School since 1996. Mr. Reichardt loves fitness and is involved in many outside activities. He currently coaches Middle school basketball and High school golf. You can find Mr. Reichardt any day in the main gym area at Appleton East. Stop by and say “hi”. Katie started teaching with eSchool PE during the 2014-15 school year. She also has taught eSchool health during the eSchool summer session. Lucas joined the eSchool team in the summer of 2017. Lucas is teaching Mindset Mastery. Traditional core courses can be taken in an alternative format. AP courses and electives not otherwise available due to low enrollments or schedule conflicts can be taken. Frequent individual student/teacher interactions, as well as parent contacts, occur to support student efforts and monitor progress based on individual needs and goals. Online courses have a high level of accountability for the time, effort and quality of student work submitted. Online courses provide rigorous, high quality, standards-driven curriculum. Course completion goals can be on an accelerated, traditional or extended basis to meet individual student needs. Course enrollments are on a continuous or rolling basis, so students can request enrollment at any time there is a seat available. Courses are available to students 24 hours a day, 7 days a week, 365 days a year. Students take greater ownership for their learning thus preparing them to be lifelong learners. Student with schedule challenges as a result of participating in a Coop, Tesla, Renaissance, Valley New School, Music etc. The purpose of the Appleton eSchool Parent Advisory Council is to enrich the eSchool experience through a community of parents committed to the mission and core beliefs of the Appleton eSchool. Appleton eSchool should offer a wide variety of course options for high school credit as generated by students’ needs and interests. Interested in taking part in the Parent Advisory Council? No qualified person with a disability will, because the District’s facilities are inaccessible to or unusable by persons with disabilities, be denied the benefits of, be excluded from participation in, or otherwise be subjected to discrimination under any program or activity to which Section 504/ADA applies. As to facilities, the District will conduct its programs or activities so that, when viewed in their entirety, they are readily accessible to disabled persons. To the extent a program or activity is now held in an inaccessible location, it will be moved to an accessible location upon request. Questions can be directed to the school Principal.